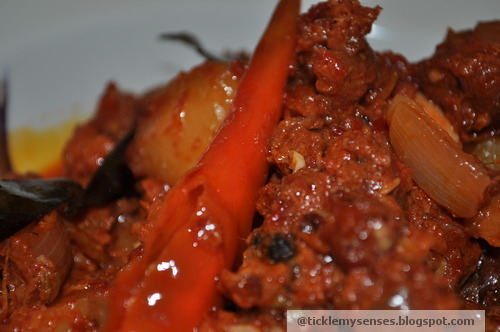 Tickle My Senses: Owner's Delight n Neighbour's Envy- Goan Pork Sausages Curry with Potatoes and Peppers! 1.Chop the onion, potatoes and pepper to medium size cubes. Open up the sausage outer covers and empty the sausage meat into a large cooking vessel. Rinse the outer covers in a cup of water and add this water to the sausages.Let the sausage meat and the gravy come to a boil on a medium flame, then close the vessel and allow the meat to cook for 10 minutes. 2. 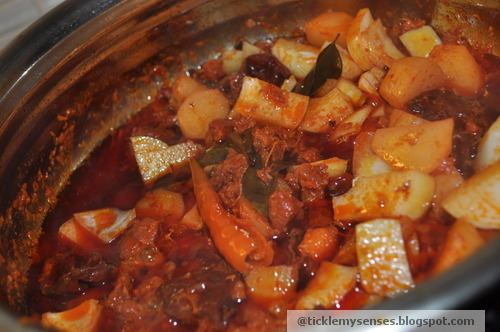 Add the cubed potatoes and slit green chillies to the meat mixture, and let the potatoes cook with the meat covered till almost done. Add the cubed onions and peppers once potatoes are almost cooked. and cook for another 5-7 minutes till onions turn translucent. Taste for salt. Drain away all the excess fat using a spoon. 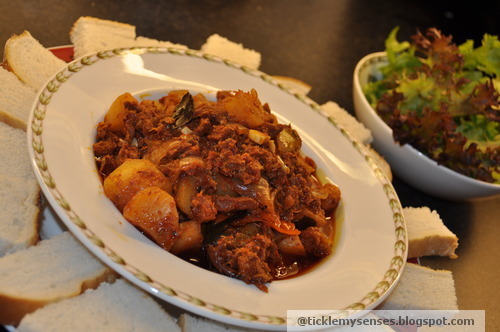 Serve hot with white bread and a fresh salad. Enjoy!! absolutely delicious curry...cant wait to try this tempting dish..
first time here...love your space. 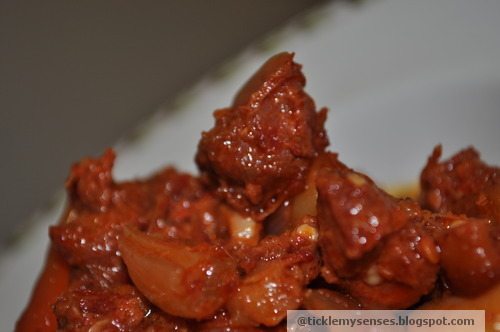 I absolutely miss Goa sausages, but here is the recipe for Goa Sausage Pulao that you might like. Fry onions until they just turn brown, add the sausages as you would for the curry, then the rice and fry well. Then add the water, salt or stock cube to taste and cover and let cook as you would any other pulao.Enjoy! Thankyou dear desiree for sharing your recipe....will surely try out your pulao soon!! Hi how have you been? 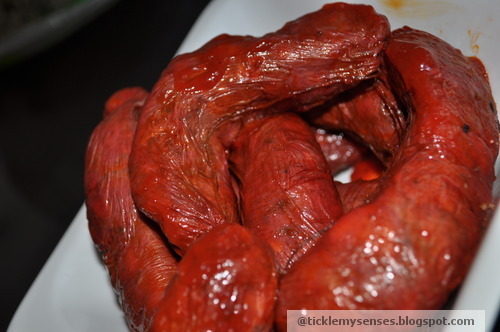 i sell goan choriz sausages at 350 for 500 grams without FAT pure meat. Do contact me on 8097696035, my name is Fatima. Wow..absolutely tempting and delicious! Loved the way you wrote this article..